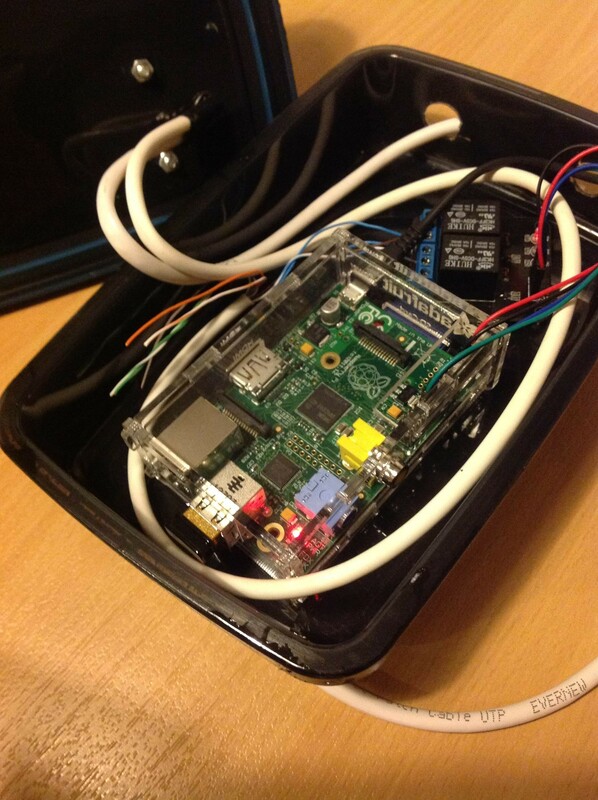 Wouldn’t it be fun if we could control Sanne’s desk remotely? At first I laughed at the idea – it sounded a bit overkill – but then, the engineering part of me took over and Thomas and I started to plan how this could be realized. 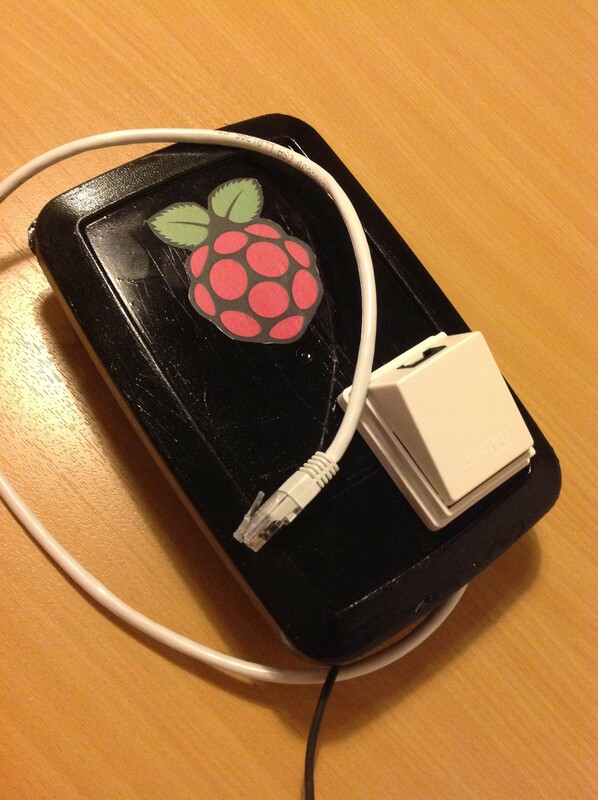 In this “special edition” Raspberry Pi tutorial, I describe how Thomas and I made this work – from the initial thoughts to the final “product”. By showing up (very) early at work a couple of days in a row we got some time to do the initial analysis of Sanne’s desk’s “height control unit” before she showed up. Since day one, I thought this part would be the trickiest one, but it turned out that Sanne’s desk was actually quite nice and simple to work with. On Sanne’s desk a manual controller is mounted – it has a set of buttons, a pair of them being “Up” and “Down”. The controller interfaces with the desk using an RJ45 cable (the desk has the RJ45 female part, and the controller has the RJ45 male part) – making it straight forward to unplug and do some voltage tests. by connecting pin x and pin z, the desk went down. So basically, what we could derive from this study was that we needed some kind of device that could trigger a relay via a wireless connection, and at the same time pass on “commands” from the manual/onboard desk controller to the desk. 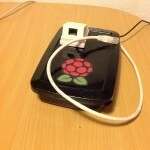 … where the basic idea is that we want to control the Raspberry Pi using a web-interface from either a computer or mobile device. 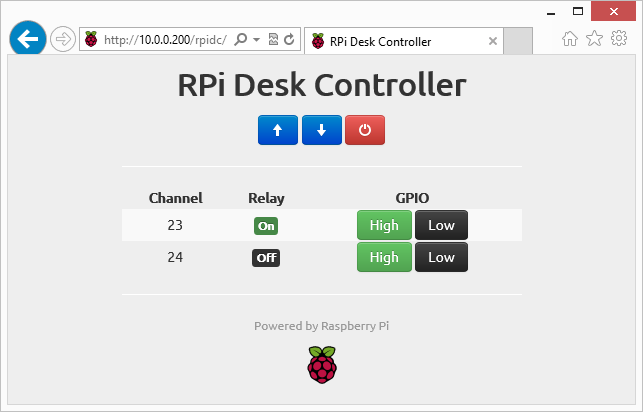 Details of the purchased Raspberry Pi hardware and peripherals (including the relay board and WiFi adapter) can be found here: Getting Started with My Raspberry Pi – Part 2: RPi Specs and Peripherals. It should be noted that, for this build, we used the Edimax EW-7811Un WiFi adapter in favor of the Ralink RT5370 (the Edimax adapter was the one we received first and has worked perfectly since then – so we found no reason to switch to the Ralink adapter). 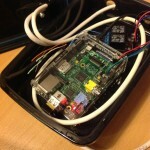 I have covered this topic in one of my previous blog posts, here: Raspberry Pi Tutorial – Connect to WiFi or Create An Encrypted DHCP Enabled Ad-hoc Network as Fallback. 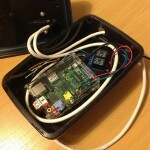 In my previous blog post: Getting Started with My Raspberry Pi – Part 1: Blog Post Survey I cover a couple of blog posts about using GPIO on the Raspberry Pi – I started using the RPi.GPIO Python module but ended up using WiringPi since it includes a small GPIO Swiss army knife application that can be invoked by non-root users. The blog post survey includes links to different sites describing each approach. Finally, it was time to put everything in a case. 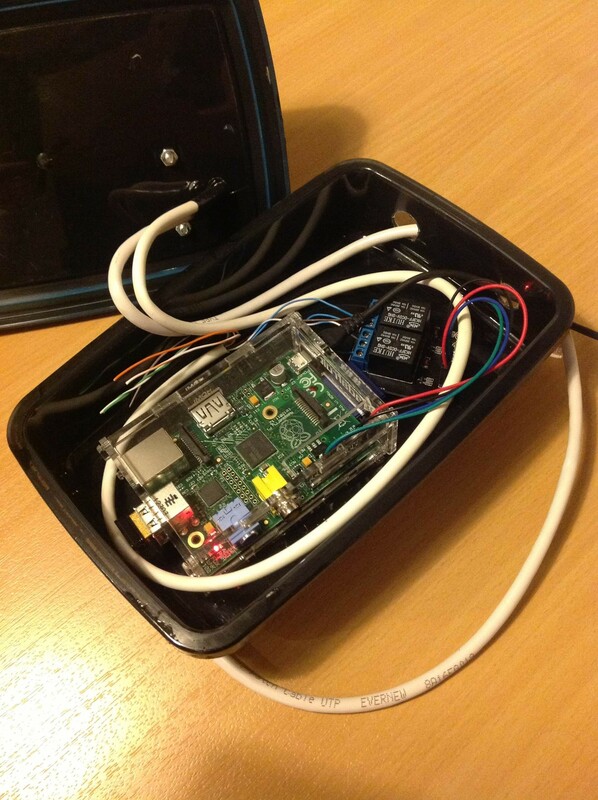 We decided to make it cheap and simple, so we bought a lunch box, drilled a couple of holes for power adapter and RJ45 cables, painted it black, added an RJ45 wall mount box on top, and finally, installed the Raspberry Pi and the relay board. 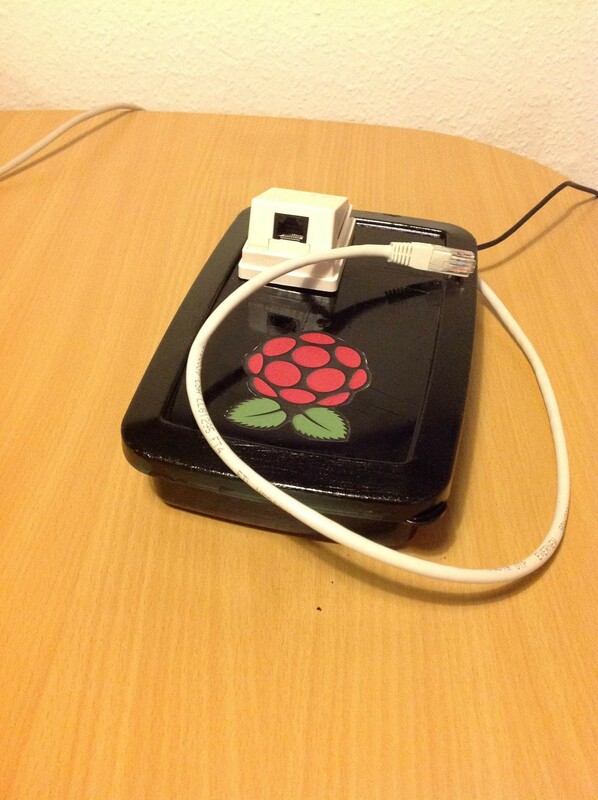 We tested the Raspberry Pi Desk Controller yesterday (Wednesday the 5th of December). First, Thomas and I arrived early, mounted the Raspberry Pi Desk Controller and installed a web-cam such that we could go upstairs and follow the action remotely – and it was REALLY funny to watch 😀 (I should probably mention that Sanne also found this prank amazingly funny, especially because we have spent so many many hours on preparing this). Brilliant. I’m going to do this to my coworker very soon. 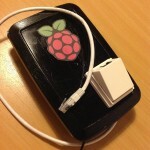 Good writeup and thank you for the idea!